Great concert but the sound wasn't that great. 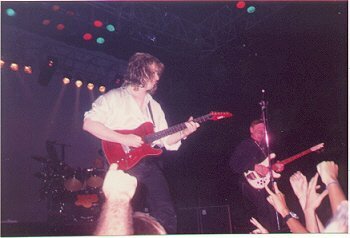 Jon's voice was prejudicated and Billy Sherwood is a mistake on the stage. 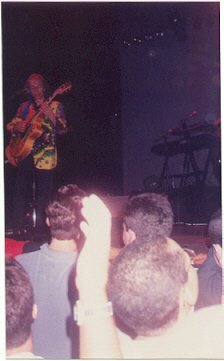 Steve Howe was great but had been better. The set list is very interesting with ancient material but I missed the new songs from Open your Eyes. They just played the title track and that's it. Greetings from sunny Rio de Janeiro. Last night was YES NITE at the Met, and my ears are still ringing! This was a show I had been anxiously waiting for since KTA1/2 and OPEN YOUR EYES. The TALK show at the Met in '95 was very uninspiring, and had left a bad after taste. 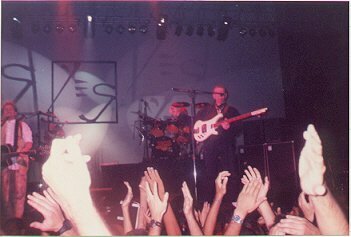 I had high hopes that with Steve Howe back we would finally have a real Classic Yes show in Brazil, something that did not happen at ROCK IN RIO '85, or with the TALK concert. 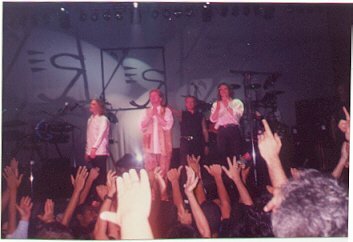 My 2 worries before the show were 1) it would not sell out, and the band would not be inspired, as happened in '95; and 2) that playing to an audience sitting at tables and being served by waiters would freak the guys out and make any band-audience empathy impossible. I so much as said to my son that if I were Yes management I'd never agree to playing at a place like the Metropolitan. OK, showtime...My son Erik and I arrived around 8 PM, and were greeted by birdsong, insects chirping, and surf sounds, straight off of OYE. We had possibly the best seats in the house, the center aisle table on the 4th row from the stage. 9:30 PM came and went, and the place was packed solid - score one for Yes! Jon walked around the back of the stage personally checking to see if all was ready. Soon after 10 PM Stravinsky came on over the PA, and the band came out, to a surprising standing ovation. My first shock - Chris Squire with a crew cut, and almost as much weight put on as myself. I was thinking "he'll never move around and jump like the old days"... Thank God I was really wrong on that one. Steve looked a little strung out, Billy appeared to be trying to make himself invisible, and Igor reminded me of Wakeman, probably because of the cape he was wearing. Alan was hidden behind his cymbals, but as "Siberian Khatru" started his presence filled the hall. 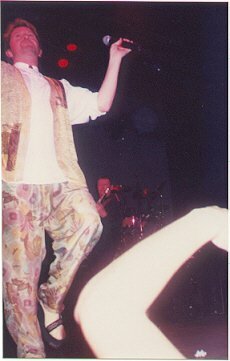 John was his angelic self, and hit it off with the audience from the beginning. As the show went on, it was clear that the set list would not be like in Europe. 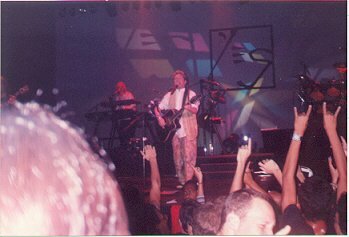 I had already learned from NFTE that there would be changes, but the set list here was very conservative, with no room whatsoever for the longer, more progressive pieces I so wanted to hear... no "Revealing Science of God", no "Close to the Edge", no "Awakening". Only the "hits", and surprisingly, only one song from OPEN YOUR EYES, the title song itself. 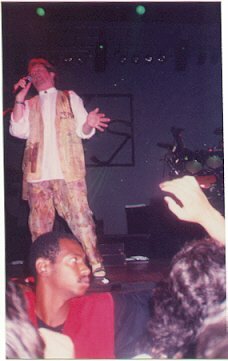 And this was announced as the OPEN YOUR EYE SOUTH AMERICAN TOUR 1998! We were probably better off, anyway. I'm one of those who do not like OYE (other than using the birdsong and chirping at the end for meditation once in a while, it's great for that), and haven't listened to it much since last December (thank God I have Spock's Beard, Echolyn and Iona to take me through these meager times). It was clear that the group or the management wasn't willing to risk anything on this one, and I could tell that many others there besides myself were deeply disappointed. Chris was the big surprise for me. What an incredible stage presence the guy has! Unsurpassable charisma, great eye contact, sincere smiling most of the time... you could tell he was having the time of his life up there, and that it wasn't only "for the money". The high point of the show was undoubtably the way he managed the bass intro to "Heart of the Sunrise". My son, 16, just now starting out on bass with a school group, and who had never liked Yes, was blown away, as were all of us. Chris was really playing "to" us on that one, and made it look soooo easy, but what sounds he wove with his Rickenbacker. That is the moment I'll never forget, that really made it worthwhile.